So far, we have simplified listing data in XL. For some XL users, that might be enough. But for most users, this is only slightly better than printing data on green bar paper. To really wow them, we need to leverage two of XL’s built in functions, Pivot Tables and Charts. Once a sales organization sees their data, often they want to “drill down” to understand it better. XL’s Pivot Tables support drill down and they make great source data from which to create charts like the one above. 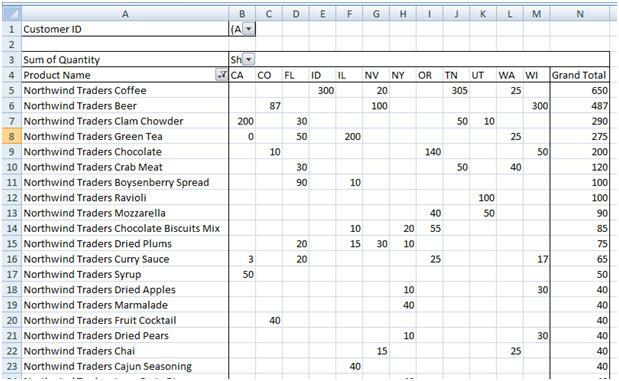 Here is the supporting Pivot Table. 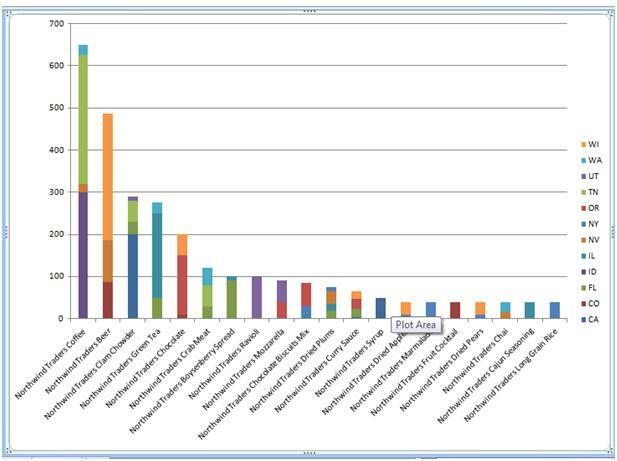 So rather than build the chart first, I always build a pivot table then create a pivot chart from it. Now before attempting to build this chart, we need to add a little more data to our Query Table. Below is the expanded SQL statement. Add it to your macro. Cut and paste the newly recorded code just before the last END IF of Macro1. You could use routines from my next posts to do the job and take care of some housekeeping problems you’ll discover when you try to rerun the macro you recorded.